The area surrounding Churchill Park’s Poplar Avenue and the area around Rabbittown’s Spencer Street are physically very close, but in other ways very distant. Poplar is in a relatively wealthy neighbourhood, Spencer is not. In census data from 2006, Poplar recorded a higher employment rate than St. John’s as a whole, while Spencer has a lower one. This applies nearly evenly across age brackets: while Spencer is lower and Poplar is higher, both follow the trend for the city as a whole. The exception in both neighbourhoods is among those aged 55-64, particularly among women. However, employment figures can only tell a partial story. This page explores data available through Newfoundland and Labrador’s Community Accounts to better understand what these figures mean for the lives of the people they represent. This data was collected using samples, so when we use it for smaller units like neighbourhoods, some fluctuations may be overstated: still, they are useful for identifying wider trends. 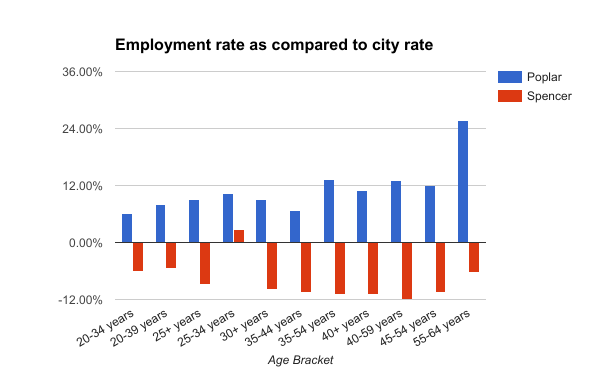 Using the employment rates for all of St. John’s as the baseline, most of Poplar’s age brackets are ahead by between five and twelve percent, while those aged 55-64 are ahead by a full 25%. Spencer’s age brackets follow the same trend but in reverse, with most brackets trailing the city rate by between five and twelve percent. The rate for Spencer’s 55-64 bracket is still below the city rate, but not by as many points as might be expected from the total figure. When we look exclusively at the rates for women, we begin to see a different picture. The rates for Spencer among women are within one percent of the city rate for the under-40 brackets, while women aged 55-64 are employed at a rate five percent higher than in the city as a whole. What sets this bracket apart? To find out whether this is a lasting phenomenon instead of just a quirk of 2006, we have to look at these figures over time. Charting the data for this bracket from 2002-2006, we can see similar rates: Spencer dropped slightly in 2004 before rebounding the following years, while Poplar peaked in that same year. This reflects a widespread improvement in the economy from that point, but a return to 2002’s rate of employment doesn’t mean a return to life as it was in 2002. What other changes can we track for this bracket across the same period, and how do they compare between these two neighbourhoods? As later cohorts who grew up with better educational opportunities age into this bracket, we see a shift in education. For Spencer in 2001, two thirds of women in this bracket had less than a high school education and none had any university education; by 2006, only a third were without high school while half had a bachelor’s or higher. The change for Poplar is more complicated: while the number of women in this age bracket for Spencer stays nearly the same, the number sampled for Poplar doubles. 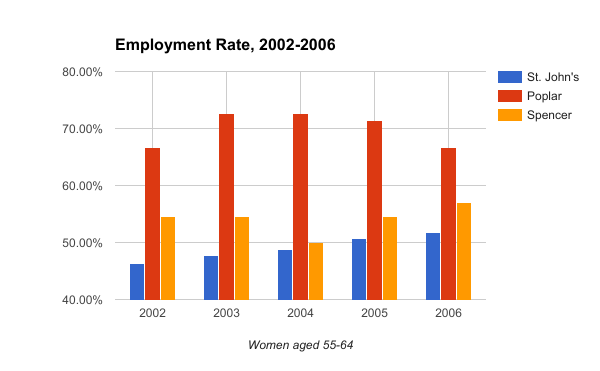 In 2001, all the women aged 55-64 for the Poplar area had university degrees; by 2006, about 10% have only high school, and another 10% have less than that. This could explain the bracket’s relative decline there from the 2004 peak: as we’ll see, there are few occupations held in Poplar that require a high school education or less. Census information about jobs is slightly harder to compare, since we only have figures for 55+ instead of 55-64 exclusive. Still, the bracket is included in these figures and retirement becomes more likely after Canada Pension Plan eligibility at 65. For Spencer, in 2000 women employed in the bracket either worked in service, mostly as cleaners, or in offices doing clerical work. In contrast, the women of Poplar were employed in education and management. By 2005 for Spencer, the employed women in the bracket were working in retail with some in management; no clerical occupations were reported in the sample for that year. For Poplar, there had been the addition of jobs in healthcare while a third of the jobs held in 2005 were in offices. Significantly, none of these office workers were in clerical occupations, which were the only office jobs held by women in the Spencer Street area in 2000. 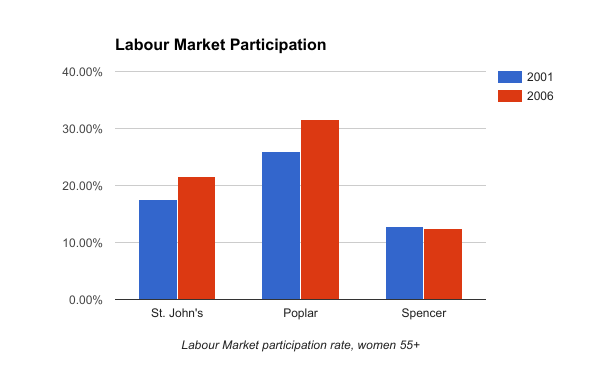 While labour market participation (proportion working or seeking work) among women aged 55-64 increased between 2001 and 2006 in St. John’s and in the Poplar area, it remained the same for Spencer. It could be that changes in officework, particularly computerisation, have eliminated a class of jobs previously available to people with less education. The relative increase in education among women in the bracket on Spencer did not win them access to the kinds of office jobs held by their peers on Poplar. Considering the province’s aging population, these kinds of job eliminations could be cause for concern: retail jobs rarely offer the same benefits or stability as office jobs. To explore this data in more detail, select “custom view”.